C.A. Confidential: Soul in the City - Starring Sean Jones @ Casa Loma, Toronto, ON - Mon July 2nd! 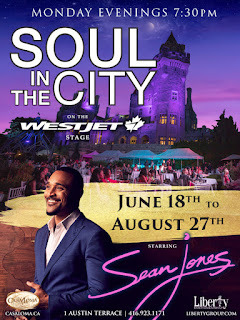 Soul in the City - Starring Sean Jones @ Casa Loma, Toronto, ON - Mon July 2nd! Monday evenings, June 18th - August 27th, Casa Loma will play host to Juno Award-winning artist Sean Jones, accompanied by a seven–piece band and special guests, in the spectacular Glass Pavilion on the WestJet stage. Enjoy stunning views of the city, majestic castle and the beautiful estate gardens while enjoying this energetic live show under the stars. Dining options while onsite include full service dining in the gardens to more casual service at the grab-and-go and gelato stand. General Admission Tickets $30 for Adults. These can be purchased onsite or in advance online here. This is a rain or shine event. Seating is not guaranteed.